GROUND ZERO PLUS 1144 DAYS,--New York, NY, Monday, October 30, 2004--Thomas Jefferson came to life last night on the floor of United Nations General Assembly. Simultaneously, Osama bin Laden was reborn via a video tape released at the same time warning America to leave Islam alone and stop trying to impose democracy on it or more Terrorism would be on its way. 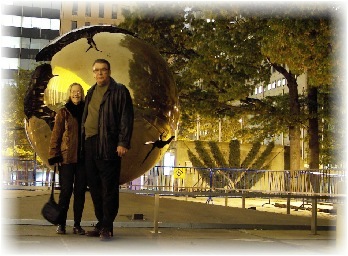 All of these events conspired last night when my wife and I attended a special lecture sponsored by the United Nations Society of Writers on the Vision of Thomas Jefferson at the United Nations. We were seated in the U.N. General Assembly Hall where nations from all over the world seek to find ways to insure peace and prosperity for all six billion residents of this planet. 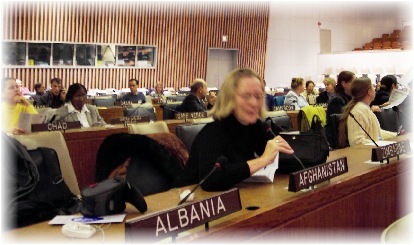 We sat in the seats of the ambassadors of Afghanistan and Albania, right next to Zimbabwe. It was a fitting setting for two of the world's experts on Thomas Jefferson to discuss the role Jefferson played in the formation of democracy both then and now. Yesterday was a ripe day of international historic events. The first was the the signing of the European Economic Union Constitution by 25 European nations in Rome. Since 1957, the movement toward the unification of Europe under one flag has been underfoot. Yesterday, as in 1787 when the thirteen U.S. states signed its Constitution, Europe launched its role as the second "democratic union." It was a monumental salute to the framers of the U.S. Constitution and, specifically to Thomas Jefferson, author of the Declaration of Independence, which, many claim, is the blueprint for modern democracy. The second historical event that happened yesterday was the release of a five-minute video tape by Osama bin Laden, mastermind behind the September 11, 2001 Terorist attack on America. 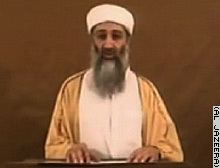 In his address, bin Laden once again warned "democracy" to keep its nose out of Islamic business or face the wrath of Terrorism as it did in 2001. As though supporting all the principles that Thomas Jefferson stood for, Osama bin Laden spoke directly to the American people. He said: "Your security is not in the hands of Kerry or Bush or Al Qaeda; your security is in your own hands." By bypassing the two candidates for President of the United States, bin Laden was telling American citizens that each was responsible for the future security of their nation, their home, their neighborhood, their family. In a bizarre way, Osama bin Laden was giving the power of "peace" and "security" back to the people. He was telling Americans that government was powerless, but they had the power to control their destiny. Jefferson had his day with Terrorism while President of the United States from 1800 to 1808. 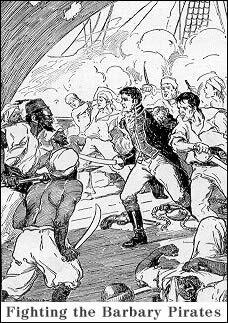 He sent the U.S. Marines to deal with pirates of the Barbary Coast. The "barbarians" stopped merchant ships and Terrorized them for bounty, and, if the ships didn't stop, they were blown out of the water. At his core, Jefferson was a pacifist. That is, he recognized war as a waste of life and resources, and, he believed that if people sought the best interests of their nations and peoples, there were ways to work out any dispute. He coined the phrase: "The price of liberty is eternal vigilance," and by that he meant that each individual must fight for and protect the rights of freedom or they would be victimized by others seeking power over them. Essentially, and ironically, that was Osama bin Laden's message to the American public. He discounted both Kerry and Bush as having any say regarding the future of American security, and placed that duty and responsibility directly on the shoulders of the American public--the citizens of democracy, the Citizens of Vigilance. Assuming the responsibility for the leadership of a nation was the heart of the speaking program last night at the United Nations. Both speakers reminded the audience that Thomas Jefferson put the duty and role of leadership upon the shoulders of each citizen and not at the feet of the government. 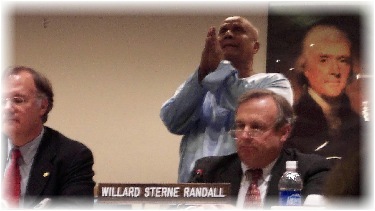 The speakers last night, Eric S. Petersen and Willard Sterne Randall, are world experts on Jefferson. 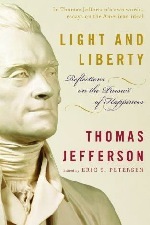 Mr. Peterson authored a recent book on Jefferson's wisdoms titled "Light and Liberty, Reflections on the Pursuit of Happiness." Mr. Randall, a Presidential Scholar, is the author of twleve books, including five biographies, one of which is titled "Thomas Jefferson, A Life". The book was nominated for a Pulitzer Prize. In a world where the average person in the 21st Century consumes most information from the media--television, radio, newspapers--both authors issued a warning that what Jefferson was promoting was Individual Vision, and the need for "eternal vigilance" among the people to protect themselves from the onslaught of big government ruling their lives. That was also the message delivered yesterday by Osama bin Laden. Jefferson, the speakers reminded, was so concerned with governments taking power away from the people that when he was asked to help shape the Constitution of the United States he did so only under the condition that there be a Bill of Rights included in it to assure and underscore the importance of individual freedom and individual authority over government. Many thought a Bill of Rights to be redundant and not inclusive of all the rights that could be enumerated. But Jefferson, wary of government interpreting the Constitution for the people, wanted the rights spelled out in clear, concise, simplistic terms. 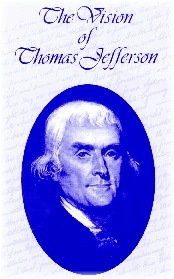 The authors also pointed out that Jefferson, while not an anarchist, was in favor of smashing the core of political power into the smallest possible pieces and scattering the fragments to the winds so that they might not aggregate in one place and become oppressive and tyrannical, as illustrated by Osama bin Laden's video taped message reminding Americans that they -- the citizens--not "Kerry and Bush" -- held the power of peace over war, of Vigilance over Terrorism. At the same time, the authors noted that Jefferson was not a promoter of war or violence. And, there was the implication that he would not support imposing one's beliefs upon others and that he might not have waged war on Iraq to force the nation into democracy, but instead would have let it evolve into a union as Europe has done. While not specficially stated, this was the ambience of the discussion. 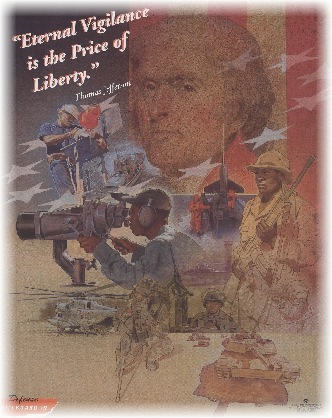 Petersen referred to the process of education and action as "Light" and "Liberty"
Mr. Petersen reminded the audience that Thomas Jefferson believe in the "Live And Let Live" philosophy. However, had he faced the tyranny of Saddam Hussein and the Complacency of a world that turned its head to mushrooming threats, no one is sure what he would have done. I had the honor of posing a question to the speakers about the importance of "eternal vigilance" and how Jefferson's view of that process played a role in today's world. The authors' answers were synonymous. It came down to two elements: education and action. Mr. Peterson referred to this process as "Light" and "Liberty." I interpreted Mr. Petersen's view on "Light" as the knowledge and awareness of a parent to protect the Children's Children's Children from the tentacles of self-imposed oppression and tyranny. These self-imposed tyrannies include Fear, Intimidation and Complacency. They are those forces that shut out the "Light" of self improvement, and drown a child into primordial pool where he or she believes evolution is impossible because the child is relegated to be a nail and the world a hammer. In other words, a child becomes a slave to "powers greater than itself," whether those powers be economic, social, political, emotional, religious or educational. 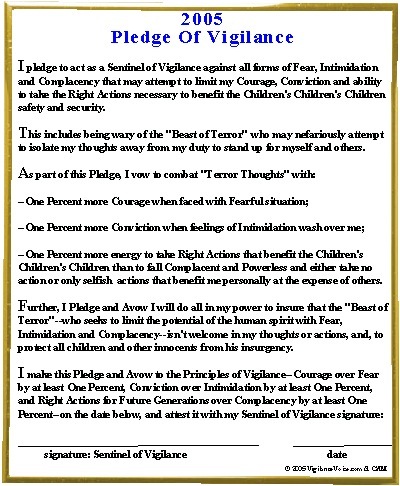 I viewed Mr. Petersen's comments about "Liberty" as the need an individual has to employ Courage to rout Fear, Conviction to overshadow Intimidation and Right Actions that benefit the Children's Children's Children to quash Complacency--the most virulent of all degrees of Terrorism. 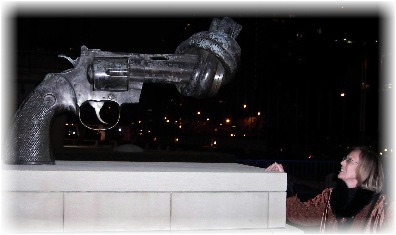 I took what Mr. Petersen said to mean that "Liberty" meant nothing without action, and only when one faced the knowledge that he or she is responsible for the future (Light) would one be willing to act. Mr. Peterson made the point that Jefferson was long on the belief that "faith without works was nothing." It was the action of the individual, the assumption of individual responsibility for the protection of "Liberty" that provided its assurance, and not government rhetoric, or government's seduction that --government would protect the "Rights of Man." Mr. Randall and Mr. Peterson sang in harmony regarding Vigilance. Both men looked at the world today through the eyes of Jeffersonian virtues. These included as foremost to be constantly wary of turning over the responsibility to perserve freedom, peace and prosperity to others since they--those who took the power from the people--would abuse it eventually. Osama bin Laden sang the same song. "Your security is not in the hands of Kerry and Bush...."
The European Union believes this also. It has built-in protection to insure that power does not flow to the few. Each nation in the EU has equal rights, as does its parliment. If one nation of the twenty-five does not ratify the current EU Constitution, then the Constitution will not become effective. There must be unanimity among all--the largest and smallest of nations must agree, and, in many cases, the EU member nations are taking the ratification issue to the people to vote upon. This is the purest form of individual duty and responsibility to freedom as Jefferson envisioned it, for it is dispersed equally among all--big and small, strong and weak. It signals to all that power rests with the people, and that power is fragmented among them, not centered in one source. In America, there are questions whether the Constitution of the United States is being violated. Has government reached a point where it is abusing the rights of the people by taking actions that do not represent the will of the people? The election slated for November 2, 2004, suggests the split in America over this issue, and, perhaps a deeper concern about the weakening of individual over collective power. Into this equation steps Osama bin Laden, threatening America with violence if it "steps out of line." Ironically, Europe enjoyed the right to sign a Constitution yesterday in 2004 only because America more than half a century ago fought an "evil empire" and destroyed a "Terrorist" perhaps far worse but equal to in many ways Osama bin Laden. His name was Adolph Hitler. The unanswered question for Americans is to what extent should we go to extend the rights of "Light" and "Liberty" to others? Should we unseat tyrants and dictators to let the seeds of Liberty grow in foreign soil? Is the right to vote and determine one's destiny in Afghanistan or Iraq worth the blood of American volunteer soldiers? And, does the War On Terrorism remind us that we, the citizens of America, have a duty to become more informed and more conscious about our own rights, our own duty, our own responsibility to the preservation of "Light" and "Liberty?" Last night, the entire question of individual duty and responsibilty seemed to flood the floor of the U.N. General Assembly. Authors Petersen and Randall opened a floodgate for many in the hall where nations have struggled to codify old wounds and unite differences in peaceful and prosperous ways. The Great Hall of the U.N. has also been a theater of Terrorism where nations have slammed shoes on podiums and shaken fists and conspired to build nuclear weapons and violate treaties by manufacturing biological weapons. But, the seats in the General Assembly of the U.N. are there for one reason--to disperse power on an equal basis among nations. In the Jeffersonian view, each nation would have an equal vote, just as in America the richest and most powerful man would have only one vote as the poorest and least powerful man/woman would have only one vote. Each voice would be equal. This is, in the final analysis, Vigilance at its best. But, it only works when those who have the Right of Vigilance employ it. Only when people understand that Terrorism's greatest weapons are Fear, Intimidation and Complacency--the latter being the most dangerous of all Terror Tools--do they realize that "doing nothing" or feeling "powerless" is what Osama bin Laden seeks. The great thrill of a Terrorist isn't bombing buildings, it's reminding people four years later that he did, and, if he wants, can do it again. Bullies thrive on the belief they can constantly intimidate those they once intimidated. A bully who has bullied others and gotten away with it only has to walk into a room to make his point. The people cower until one day someone stands up to the bully. That was the point of last night's seminar. Only when we, the Citizens of Vigilance, stand up to the Beast of Terror, will "Light" and "Liberty" be not just ours, but our children's and their Children's Children's Children. Even though the world seems to be coming unglued in many sectors, I believe that Thomas Jefferson would be pleased today. He would see Europe, a nation that only a few decades ago had historically been killing one another for countless centuries, uniting. He would see Americans, rightly or wrongly, dying in foreign lands to depose tyrants and force "democracy" to seed. He would see Americans at home split into two factions, realizing that neither candidate represents the "true leadership" of the Jeffersonian kind. And, hopefully, Jefferson, were he alive, would walk before a television camera and point to government and say: "Look, these guys can't run your lives. They never could, and they never will be able to. It is you, the Parents and Grandparents, the Uncles and Aunts, the Mothers and Fathers, the Nephews, Nieces and Citizens of Vigilance who must become the leaders of your lives, the leaders of your nations. It is your shoulders that the duty for leadership resides, not some elected official. You must stop seeking others to preserve and protect your liberty, for you will always be either disappointed or seduced into thinking another can give you what you want. No human being can provide you what you want, for expectations and realities are as different as night and day. So, when you vote in this election, vote for Vigilance, not a person. Vote for what is right for the future of your children, not for a person. Vote for your duty to lead, not to abdicate that duty to someone else. If you vote that way, you'll have Light and Liberty." 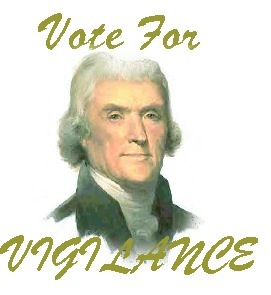 If Jefferson said those words, he would be calling on us all to Vote for Vigilance! Go To Yesterday's Story: "American's Constitution Crumbles While The European Union's Grows Strong"